The city of Santa Monica will hold is annual All You Can Carry Pumpkin Patch on Wednesday, October 31. Photo courtesy of the city of Santa Monica website. 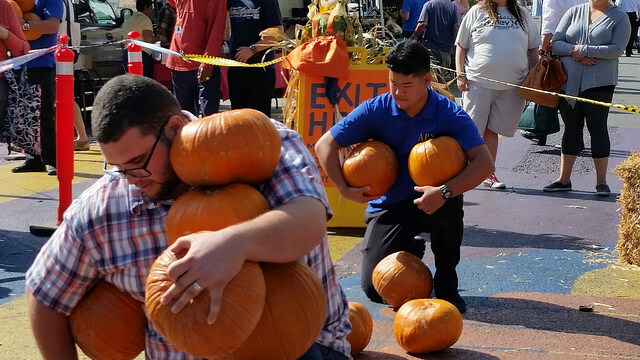 SANTA MONICA—The city of Santa Monica will be hosting its annual All You Can Carry Pumpkin Patch on Wednesday, October 31. According to the city of Santa Monica website, participants who can balance pumpkins down the 25-foot walkway get to take home their gourds for only $5 total. The current record is nine pumpkins and there is a limit of one entry per person, where participants can carry as many pumpkins possible for $5 fee The city is encouraging costumes. The event will transpire from 8 a.m. until pumpkins run out. Visitors can now shop earlier at Santa Monica’s Wednesday Farmers Market. Market hours are 8 a.m. to 1 p.m. rain or shine. Santa Monica’s Wednesday Farmers Market is located on Arizona Avenue and 2nd Street. Parking is available in parking structures 1-4 on 2nd or 4th Streets.